Weighty Matters: Breakfast for Learning needs to Learn the word NO! Breakfast for Learning needs to Learn the word NO! "leading national non-profit organization solely dedicated to child nutrition programs"
They also happily take money from the folks who make Nutella who then use Breakfast for Learning's good name by leveraging their partnership to inspire co-branded sales. "relationship with Nutella does not mean that we endorse their product". Well an anonymous tipster out there read that post and sent me a 2009 press release from another Nutella/Breakfast for Learning co-branding. This was a press release that appears to me at least, to have been put out by Breakfast for Learning as that little blurb at the end of the release steers back to Breakfast for Learning and not to Nutella or Ferraro. "learn about the top five reasons kids should eat breakfast, find easy recipes for on-the-go families and learn tips to encourage kids to eat breakfast." "Through participating in the Better Breakfast Challenge, families are helping ensure that students across the country get the proper nutrition they need for healthy development"
"With the current economy and rising foods costs, we are seeing a greater reliance on child nutrition programs. By signing up for the Challenge, parents can help their own children develop life-long healthy eating habits, as well as make an investment into a bright future for thousands of others who rely on our programs." And while the website's now gone dark, I think it's fairly safe to say that it recommended Nutella as part of a nutritious breakfast and as a life-long habit. 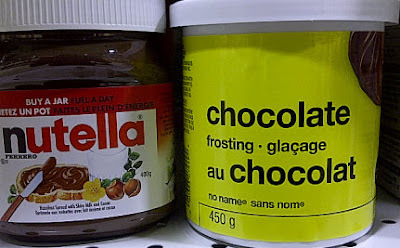 A few months ago Journalist Marie Allard from French newspaper La Presse decided to compare it to No Name Chocolate Icing. Compared with Nutella, per tablespoon the chocolate icing had 25% fewer calories, and 27% less sugar. So I decided to write to Wendy and ask her two simple questions. "Given Nutella is basically nutritionally interchangeable with chocolate icing, I’m wondering too if you might comment why you and Breakfast for Learning would want to support its use in breakfast? Would chocolate icing based breakfasts be better than no breakfast in the eyes of Breakfast for Learning?" "To flesh the question out – if the makers of chocolate icing wanted to donate money to Breakfast for Learning and to recommend it be spread on bread for breakfast for children, would Breakfast for Learning allow that?" "To be honest, I do not really find it very constructive to respond to purely hypothetical questions like the one you have posed. BFL does not endorse any products period, the reality is that we are simply trying to ensure that children have access to breakfast and without our financial assistance many may go without." "Wondering if you might have some comments for me as to whether or not the press release I’ve included constitutes promotion of Nutella by Breakfast for Learning?" "In any donor driven campaign Breakfast for Learning is simply the recipient of funds. The quote attributed to me, was in support of the Nutella’s financial commitment to Breakfast for Learning and the importance of eating breakfast." While there may be some shades of gray in public private partnerships with Big Food, I really would have thought that Wendy's answer to the chocolate icing question would have simply been, "No". The fact that it wasn't, and the fact that Wendy at least publicly denies the reality that co-branding misinforms parents and stains her and Breakfast for Learning's credibility and integrity, is more than astounding, it's tragic.